Within two days, the SPCA said I could take one of the black and white puppies we had seen earlier. We brought him home and named him Oreo for all the Oreo-cookie crumbs that freckled his nose. 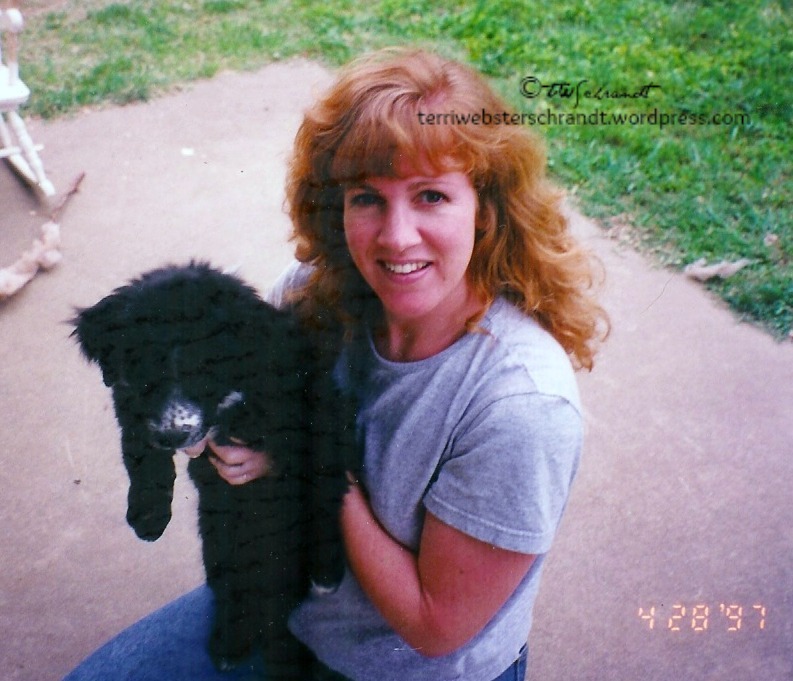 Here is what Oreo looked like when we got him (yes, that is me 18 years ago). That is when I got the phone call. When Darla checked on Oreo, she found him sprawled across the deck stairs. He was very near death. While trying to reach me, she and a neighbor put him in the car and took him to the closest vet. I have wanted to write this story for a long time and this prompt for Writing 101 is as good a time as any. The twist to this prompt, to make it a three-part serial, will give me the opportunity to continue the series with the back story to celebrate Oreo’s wonderful life…stay tuned. Oh my Terri. This is a deeply sad story. I’m sorry that you weren’t able to be there when he was euthanized. I hope you’ve been able to let go of the guilt of that part of the experience. I have a little bit, thank you. Reading your post and other bloggers’ stories about their dear departed pets just keeps it a little fresh. But that book does get me through. Thanks for reading, I appreciate it very much! So sorry for your loss. I am glad you were able to write down your story–I find that it helps. You’re welcome. I have their ashes, and pictures with each. They will always be with us, even when we move. I’ve been a cat person, but I have had many similar situations with our beautiful fur people, who adopted us. I read this, remembering all the moments when I had to make decisions. When I was younger, I always thought euthanizing was something I could, personally, never consent to, but as I grew up, and realized my selfish desire to not lose a loved one, a child of mine – for all my fur babies were my children – I had to make that decision four times over the last 10 years. I have stayed with each, holding them, whispering my love to them, as they crossed the rainbow bridge. My heart breaks for you, as I know too well what you went through. What gives me a semblance of peace, is that my decisions were always about not wanting to suffer any more. You’ve been brave in writing, but I also know, that this allows the grieving process to go forward. Our fur babies are always in our hearts, and we know how great their presence has been, and how nourishing they were in our lives. Thank you, Fimnora, for your very kind words and I am sorry you lost your fur-babies. It truly is the right thing to let them go without their suffering. You lost a family member and Oreo still lives on in your family members memory and hearts forever. Thank you Martin, for your kinds words! I appreciate it! And thank you for the wonderful youtube link! Such a sad story, Terri. Sorry for your loss. Oreo had a good life, and sadly, it was his time to leave you. I’m surprised that two vets wanted to run tests on him, when surely, he was suffering, and that must have been so hard not only on him, and also for you to see. It is never easy saying farewell to those we love. Thank you. I think many vets are just after dollars! I appreciate your kind words! That is sad, but I suppose, it happens everywhere. Thank you,Deb. That made me cry all over again, but more of a healing cry. I appreciate your comment more than you know! I had a puppy with a heart defect who lived years after her estimated lifespan…that’s always something I’m grateful for! I’m reading a lot about dogs who seem to wait and mourn over the loss of their owners/friends. I think it’s very sweet. I have little in the way of material things to leave. Dogs are wiser than men. They do not set great store upon things. They do not waste their days hoarding property. They do not ruin their sleep worrying about how to keep the objects they have, and to obtain the objects they have not. There is nothing of value I have to bequeath except my love and my faith. These I leave to all those who have loved me, to my Master and Mistress, who I know will mourn me most, to Freeman who has been so good to me, to Cyn and Roy and Willie and Naomi and—But if I should list all those who have loved me, it would force my Master to write a book. Perhaps it is vain of me to boast when I am so near death, which returns all beasts and vanities to dust, but I have always been an extremely lovable dog. FRank, this is just marvelous! Thank you for sharing. I’m going to copy this so I can refer back to it easily. Oh Terri, I feel for you so much. I wept while reading this thinking of my similar situation with my dog Buddy many years ago. It’s still tender and brings tears to my eyes. Hugs to you x. Thanks, DesleyJane, pets are so hard to lose, even though we know their lives are much shorter than ours. Hugs back to you! Having recently experienced the loss of a pet, this post hit home extra hard. 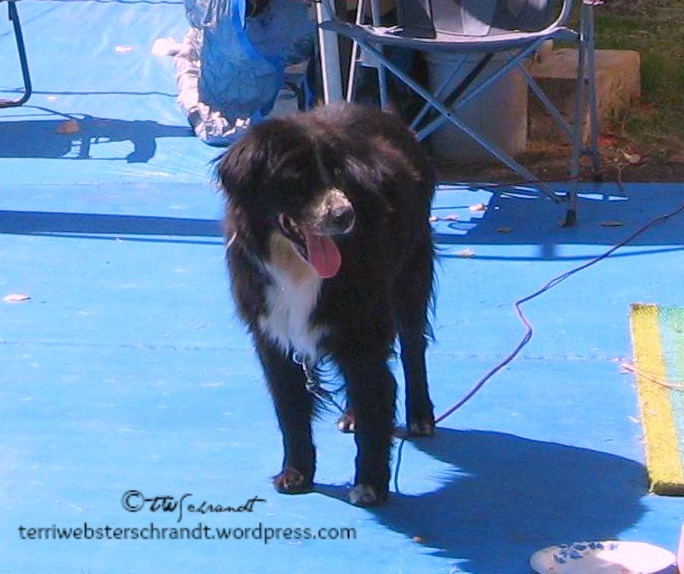 You shouldn’t feel guilty about not being there when Oreo passed, although I know that’s easier said than done. Thanks for commenting, Fannie, I’m so sorry for your loss as well! sounds like he had a great life, although always hard to see the end. Sorry for your loss Terri. I got so teary eyed during work, but I am happy knowing that Oreo got to have such an amazing life with such a great owner. Oh, thank you Diana! That’s the problem with reading blogs at work (it’s happened to me!)! Martha, it was an earlier post of yours that inspired me to write this one and I thought of you and your doggies as I wrote this. You should not ever feel bad about not being present at his final moments. It’s difficult but remember you did always your best. What a lovely story, Terri. I have never had a dog in my life (my parents claim they aren’t animal people), but this kind of story is a reminder of why we call dogs man’s best friend. Thank you for sharing. Excellent writing. You hooked me to read you piece by it’s title. Once I started to read it, I was right there with you. Only once in my adult life did I have a dog. Your post dashed me back in time to that wonderful and painful experience. Thank you Janet for that great feedback! I appreciate it! I never thought a story of a pet could bring me to tears. Nice writing! Do keep it up, and I look forward to the rest of your Writing 101 pieces. Thank you! (Sorry for the tears). I was pretty teary-eyed even writing it. I was writing about the loss of a person for this assignment as well, and I am sure mine is less than half as touching as yours haha. Your language is simple yet effective. Thank you, we are all just suckers for our fur babies! That was very heart touching! He had a long happy life Terri and you did what you felt was best for Oreo. I imagine that Oreo is thankful that you did not make him have to suffer. It is so difficult to make the decision to put our pets down. I still carry guilt from Princeton, but I didn’t have another choice. I keep telling myself that he is trying to tell me thank you. I really appreciate that. I know he was a happy dog! That’s wonderful! He had a very happy and long life!